Head to SeatGeek.com to get NHL Playoffs tickets or NBA Playoff Tickets! And learn how to find the lowest Stanley Cup Ticket prices. The Los Angeles Lakers were victorious over the Boston Celtics last night by a score of 83-79, ending the Celtics season and giving the Lakers their sixteenth Finals Championship. Throughout these NBA Finals, we have been giving you game recaps, along with the listing prices for tickets on the secondary market for each game. Now that it’s all said and done, we wanted to take a look back at the prices for tickets for each game, and compare the data to that of the NHL Stanley Cup Finals. Both of these series featured two marquee match ups; the Stanley Cup Finals was between the Philadelphia Flyers and the Chicago Blackhawks. The NBA Finals was even more of a dream match up; the Celtics and the Lakers are two of the winningest and most storied franchises in all of sports. Yet surprisingly, especially given the greater popularity of the NBA over the NHL, ticket averages were greater for the NHL Finals than they were for the NBA Finals. The average ticket price for tickets for the Stanley Cup Finals was $718, compared to $699 for the NBA Finals ($633 if you exclude Game Seven). In the NBA Finals, tickets for Lakers home games went for much more than tickets for Celtics home games. The average prices for tickets in the Staples Center in LA were $817, versus $541 for games in the TD Garden in Boston. During the Stanley Cup Finals, the average price for tickets was greater for Blackhawks home games than for Flyers home games. In Chicago, the average was $810, whereas the average in Philadelphia was $626. 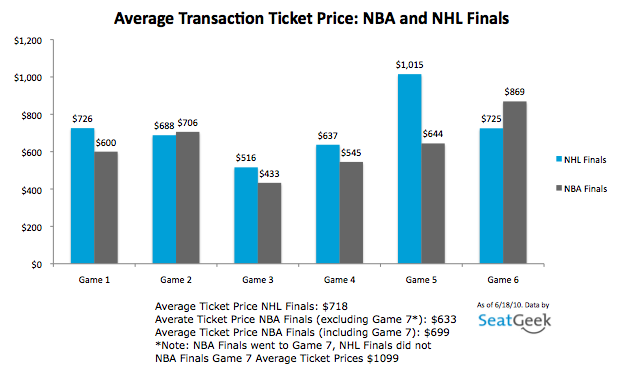 Television ratings to gauge each sports’ popularity aside, it is interesting to see that fans were willing to pay more for NHL Stanley Cup Finals tickets than NBA Finals tickets. I would have expected to see the opposite, considering that basketball is generally considered a more popular sport in the U.S. than hockey. Nonetheless, hockey season and basketball season have finally come to a close. Actually, with LeBron Mania erupting and causing the world to stop when free agency begins on July 1, basketball season is far from over. Be sure to check back with us at SeatGeek for our take on the LeBron saga, as well as for more sports news and ticketing data. Questions, comments? Feel free to follow us on Twitter @SeatGeek or send over an email to justin@seatgeek.com.